This quad also shows the Mayburg connection with the Sheffield & Tionesta. 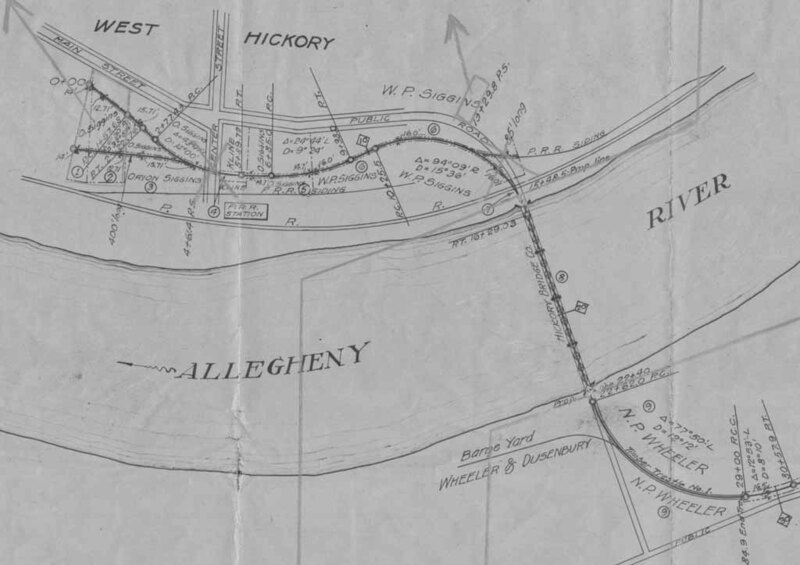 With a decent printout of these quad maps, you can follow the grades of the railroad today! When the United States seized control of all privately-owned common-carrier railroads during WWI, the effort to pay them equitably for the seizure was to send teams of surveyors into the field to document EVERYTHING that a railroad owned. The resulting ICC Valuation Maps documented all railroads in high detail to survey quality, including every item of interest. Two original copies were made, one for the railroad and one for the Government. 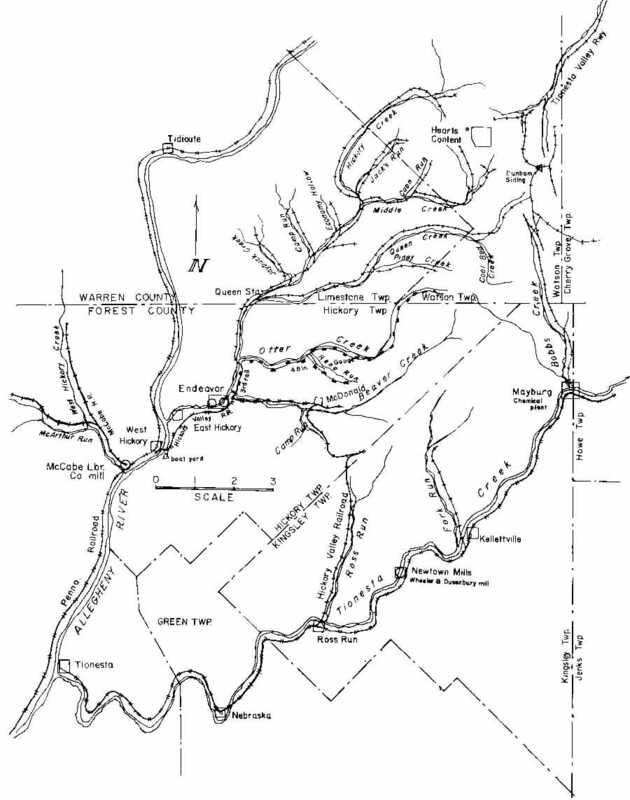 Even little Hickory Valley was documented, and the ICC Valuation Maps copies were located in the National Archives in Washington and scanned. 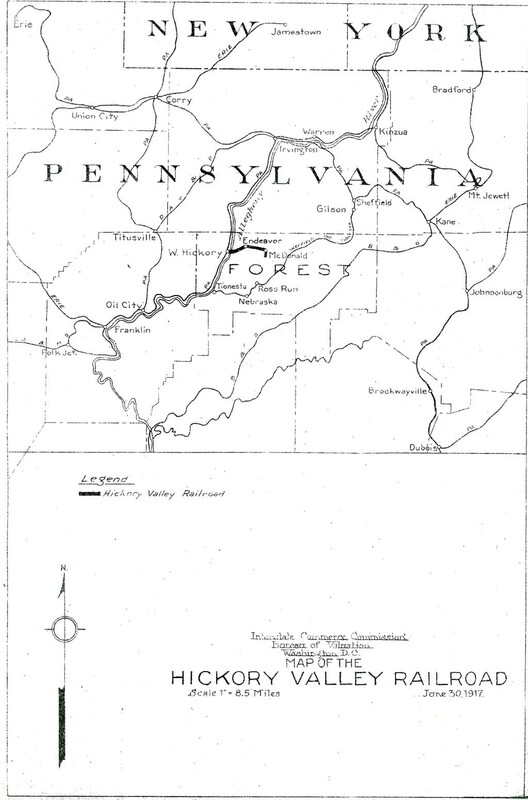 Excerpts from those railroad maps are below, showing the track details as they were in 1917 in West Hickory and Endeavor. Because Wheeler & Dusenbury was a private logging railroad and not a common carrier, the railroad above Endeavor was not on the maps. Neither was the section to McDonalds, which was basically a mystery because the ICC reports always listed that track to Poors Manual of Railroads and the Pennsylvania Public Utilities Commission in the same year.